From Spaetzle to Samosas: Flavors of India for Breakfast? Flavors of India for Breakfast? Breakfast is one of my favorite meals of the day. I love it when I get to sit with my husband and eat the kind of breakfast my kids wouldn't touch. 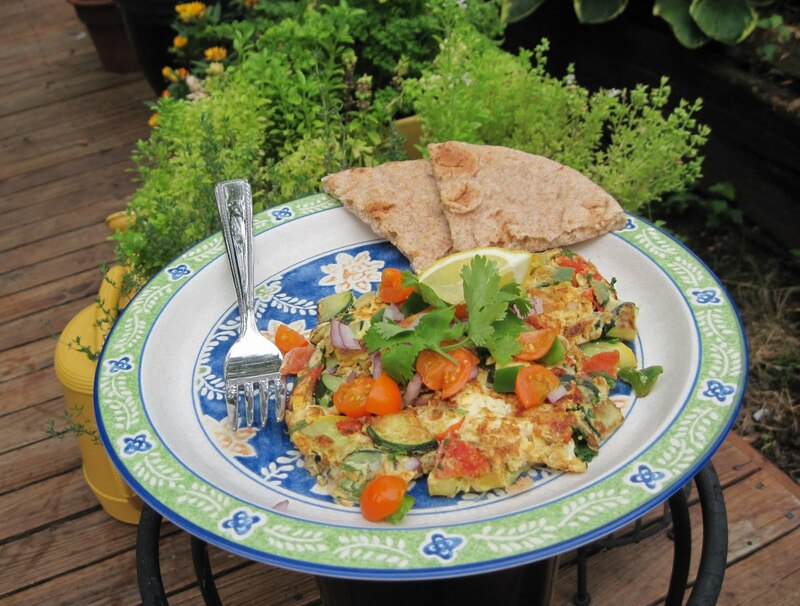 You know, the grown up kind like a fragrant fritata or a veggie loaded omelet. This recipe shown here would lend itself well to a light lunch or supper. The inspiration for this loaded scrambled egg comes from the Parsi dish 'Akuri' which is an explosion of flavors right at breakfast. The flavors in this vegetable loaded scramble can be kept light as my husband prefers it, or a bit stronger the way I like it. What's so amazing about this meal is that you can get an entire serving of vegetables right there for breakfast. I am estimating the quantities in this recipe as I have never measured it. Clicking on this picture will show you a larger, and more mouthwatering version. Heat the oil in a pan and add the chopped onions. If you make this for lunch or dinner and like things a bit livelier you could add a small amount of crushed garlic. Too much garlic will overwhelm the balance of flavors in this recipe, so go easy. *Saute the onion until translucent and then add all the vegetables except for the tomato, cilantro, and left over potatoes and chickpeas (if adding). Saute on medium heat for 3-4 minutes stirring occasionally. Add the seasonings, tomato, chickpeas and potatoes (if using) and stir, let heat through for 1-2 minutes. Add the chopped cilantro and then crack over the whole thing, the eggs. Stir gently but do break the yolks. Reduce the heat to medium low and allow the egg to set. Stir gently periodically to make sure all the egg is cooked. Taste for seasoning and adjust as needed. I love to eat this with a little extra chopped fresh onions, tomatoes, and cilantro. A squeeze of fresh lemon brings out the flavors of all the vegetables. Serve with it toast or better yet, some toasted pita bread or any Indian roti. This is a substantial meal which will keep you satisfied during a long morning or comfortably filled on a warm summer night. Almost all my recipes lend themselves extremely well to substitutions and additions. To me cooking has always been creativity. I was lucky that I had a mother who is an amazing creative cook and a father, who is a fantastic cook in his own right. My childhood memories are filled with family friends appearing suddenly on a Sunday morning at our door with grocery bags filled with fresh ingredients. 'We brought food, will you cook for us?' And my parents never disappointed them. Everyone was handed kitchen tools, cutting boards, bowls and colanders and given instructions. Soon the kitchen was filled with the sounds of animated discussions, laughter and the aromas of a multitude of spices, herbs and fresh ingredients coming together in an altogether magical way. *A note on cooking onions for this recipe. If you like a light flavor add the veggies when the onion is translucent. If you like the flavors stronger let the onion start to lightly brown before adding the veggies. Cooking is a forgiving art. So go for it. And for anything you didn't like, give it to the dog or the sink disposal. I've never heard them complain. I would love to have this for breakfast everyday. Love the vibrant color.